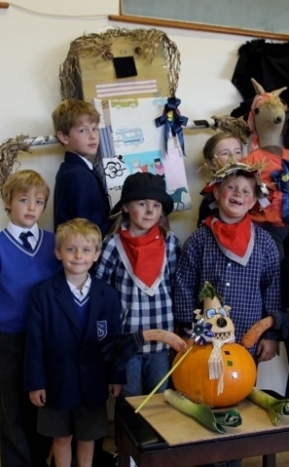 The children in Kindergarten to Year 2 were set the task of making a scarecrow at home as part of Skippers Hill’s first ever Scarecrow Competition. The results have been fantastic! The scarecrows could either be a traditional design or something more original. Entries were remarkable and certainly very creative! Reception have been learning about the people who help us at school. They took a camera around the school and took photographs of some of the people who help us and then described what each person does. For example, "Mr. Lewis is in charge", "He keeps us safe", "Mr. Lewis helps everyone." The Junior Department has introduced ‘Fun with Food’ this term; an innovative afternoon club which is proving to be tremendously popular. 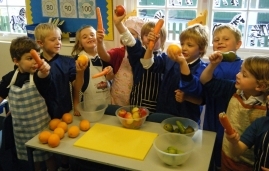 A group of 10 children meet on Wednesday afternoons bringing with them an apron, a hair tie, clean hands and, of course, an enquiring palate and a hearty appetite! 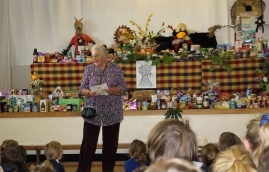 It has been a busy week as Skippers Hill celebrated Harvest Festival Week. 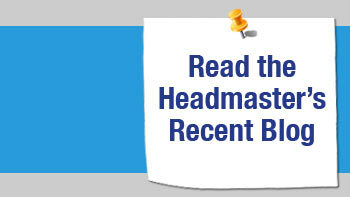 The Harvest Assembly was a wonderful event, which included: the Intermediate Choir performance of the complicated “Sumer is y cumen in” conducted by Mr Lewis; Reception and Year 1's entertaining ‘Dingle Dangle Scarecrow’; and Year 5's story about the importance of buying Fairtrade goods. 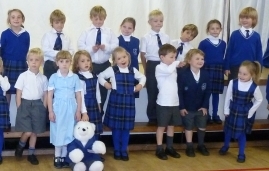 After all the preparation and anticipation leading to the Junior Songfest, the day eventually dawned and Years 1 and 2 were looking forward to meeting the children from Five Ashes Primary School. The children from both schools learned songs together, including 'Little Bird' and 'I love Flowers', before putting on a wonderful concert for parents and teachers. Don't forget to get tickets for the Children’s Disco taking place on Tuesday 23rd October. Please let your Form Parent know if you are willing to volunteer to help on the night. The School's Christmas Fayre will be on Saturday 1st December 11am - 1pm. 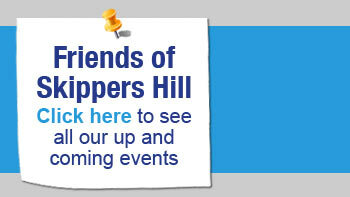 To advertise in the A5 programme please contact Lynne Gadsden or Nicola Pharoah via the School Office or email FOSHA@skippershill.com. Artwork is due by 31st October. If you can donate raffle prizes for the big day please contact your Form Parent or anyone on the FOSHA Committee by 7th November.